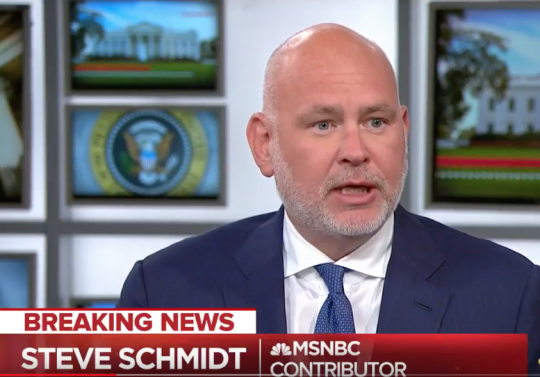 Ex-Republican strategist Steve Schmidt is no longer a political contributor to MSNBC due to his political advising of former Starbucks CEO Howard Schultz's potential presidential run. An MSNBC spokesperson told the Washington Free Beacon that Schmidt is not a contributor while he advises Schultz on the bid, adding the timing was due to moves by Schultz this week that made his candidacy more real. An IQ Media search showed Schmidt hadn't appeared on MSNBC as a a contributor since Jan. 8. Schultz infuriated Democrats this week by announcing he was considering running as a "centrist independent" in 2020. They fear the self-made billionaire could siphon valuable votes from the Democratic nominee and help President Donald Trump win reelection. Schmidt worked in the George W. Bush administration and served as chief strategist for John McCain's failed presidential run in 2008. He pushed for Sarah Palin to be McCain's running mate but later said he regretted the pick and called her unfit for office. He became a reliable critic of the Republican party in the years afterward, and he is one of Trump's strongest critics on television, frequently lighting into him as a dangerous threat to democracy. He finally officially left the Republican Party in disgust last summer over the Trump administration's border policies and fully aligned himself with the Democratic Party. It was reported last year that he was potentially going to advise Schultz, who was until recently a Democrat, on a presidential run. MSNBC host Nicolle Wallace, who also worked on the McCain campaign and now also openly supports Democrats, pressed Schmidt Wednesday about his decision to help Schultz on "Deadline: White House," citing concerns it could help Trump. "People are terrified that you, one of the most visible Trump critics, are now behind someone that they feel like can take away the Democrats’ best chance of toppling Donald Trump," she said. "Nobody is voting," Schmidt said. "But we're already scared!" Wallace said. Schmidt criticized some of the far-left policies being pushed by 2020 Democratic frontrunners, saying they are as dishonest as Trump promising Mexico would pay for a border wall. He also said the people who are shouting down Schultz's candidacy were the same people who "put their thumb on the scale" to help Hillary Clinton win the 2016 nomination over Sen. Bernie Sanders (I., Vt.) and ensured she would beat Trump. Schmidt was one of the latter people. He predicted frequently in the month and days before the 2016 election that Clinton would defeat Trump in a landslide, at one point telling "Morning Joe" she could get over 400 votes in the Electoral College. UPDATE: 3:53 P.M.: This article's headline took out "MSNBC drops" and was replaced with Schmidt being "no longer a contributor." This entry was posted in Politics and tagged MSNBC, Nicolle Wallace. Bookmark the permalink.